Known for its iconic Golden Gate Bridge, historic cable cars and colorful Victorian houses, San Francisco is the hub of city life within Northern California’s infamous Bay Area. It’s a coastal city with a distinctive skyline and a little bit of something for everyone. If you’re looking for your next California getaway, San Francisco is the place to stay. From legendary tourist attractions, to delicious food and an always interesting nightlife, there’s more than meets the eye within this city’s skyline. 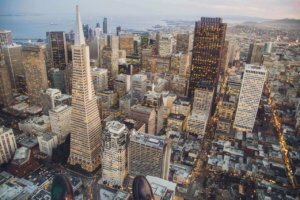 To help you plan, our San Francisco private jet charter experts have compiled some of the best things to do in the city. There’s so much to do in San Francisco, that it would be hard to list everything you can do during a weekend getaway in the Bay. So, here are the top 4 things you must do on your next trip to the Golden Gate City. Visit the Golden Gate Bridge – Seeing this icon in person is one thing about San Francisco that never gets old. Both sides offer a different, incredible view and walking on the bridge is equally breathtaking. Riding on a Cable Car – This may seem simple, but taking the most historic form of transportation within San Francisco to get from one part of the city to the other is a one-of-a-kind experience. Tour Alcatraz – This small, rocky island that sits in the middle of the San Francisco Bay is jammed packed with history. Get up close and personal with the rich history of life on this island and in this prison, that’s unparalleled elsewhere. Catch a game at AT&T Park – A baseball game at the infamous San Francisco Giants’ AT&T Park is a memorable experience. The stadium itself is recognized as one of the most scenic baseball parks in the United States and the passion of the Giants fans is something you won’t find anywhere else. Ready to getaway? Skip the traffic and the airport lines and fly private jet charter to your weekend getaway in San Francisco. With flexible flight times, no extra bag fees and plenty of extra leg room you can fly in and out of the city at ease. Whether you’re flying for business or personal, our San Francisco private jet charter team can help you arrange your flight itinerary with the best charter options available. With access to more than 5,000 aircrafts worldwide, your options for travel with Pacific Coast Jet are virtually limitless. Book your next San Francisco private charter with us to see why travelers everywhere choose to fly with Pacific Coast Jet.